According to a survey conducted by the financial portal Investing.com, Amazon shoppers have said that they would like to buy a wider variety of products on the e-commerce giant’s platform. One of the products that shoppers said they would like to be able buy on Amazon would be cryptocurrencies. Investing.com surveyed more than 1000 of Amazon’s shoppers. The survey was conducted to assess ordering frequency as well as how much customers trusted this company. One of the questions asked during this survey was about which products they were comfortable buying on Amazon.com. 12.7% of the respondents stated that they would be comfortable buying cryptocurrencies on the e-commerce platform. The Canadian cryptocurrency exchange QuadrigaCX’s impending collapse was in the news throughout last week after it filed for creditor protection and revealed that it owed its customers more than $130 million. The latest news with regard to the exchange’s situation is that the company has been granted the exchange its request by a Supreme Court Judge from Nova Scotia. The judge has given QuadrigaCX a thirty-day stay of proceedings during which the company can try and recover its funds and also look for other options through which it can pay back its customers. Police arrested a group of people in the town of Klingenthal, Saxony in Germany for stealing electricity to run a cryptocurrency mining farm. The German police reportedly zeroed in on a network of 49 computers that were operating in a building that used to belong to electrical services company PGH Elektro. It was found that since 2017, this operation had allegedly used up electricity enough for 30 households. Due to this the electricity supplier suffered damages of about €220,000 (~$250,053). According to local news reports, of the 49 computers, 30 were fitted with crypto-mining GPUs (graphics processing units). These systems had a total of 80 GPUs installed. 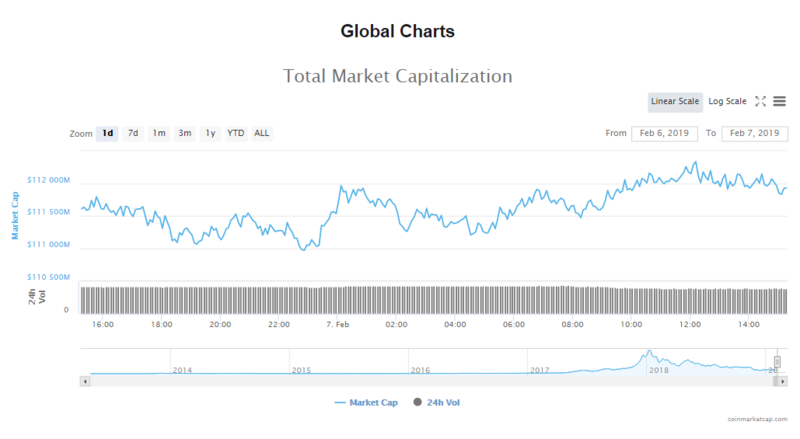 The total capitalization of the cryptocurrency market has stayed more or less flat since yesterday and is at $111.92 billion. Bitcoin remains down by 0.16%, with its current token price at $3415.94. Market capitalization of the crypto is now at $59.86 billion and trade volumes are $5.05 billion. The world’s third most valuable cryptocurrency has gained 1.48% to a current token price of $105.39. 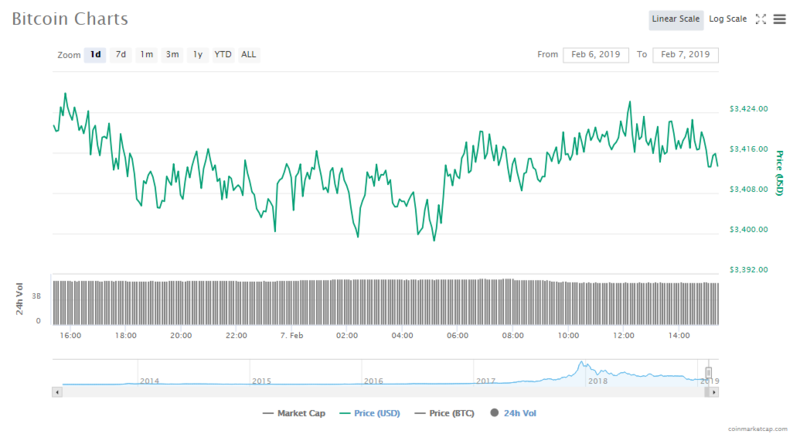 The altcoin is now worth $11.04 billion and is experiencing trade volumes of $2.36 billion. Movements in the top ten list continue, with Bitcoin Cash once more going up one place to become the fifth most valuable cryptocurrency in the world. The altcoin’s token price gained by 2.53%, the biggest jump among the top cryptos. 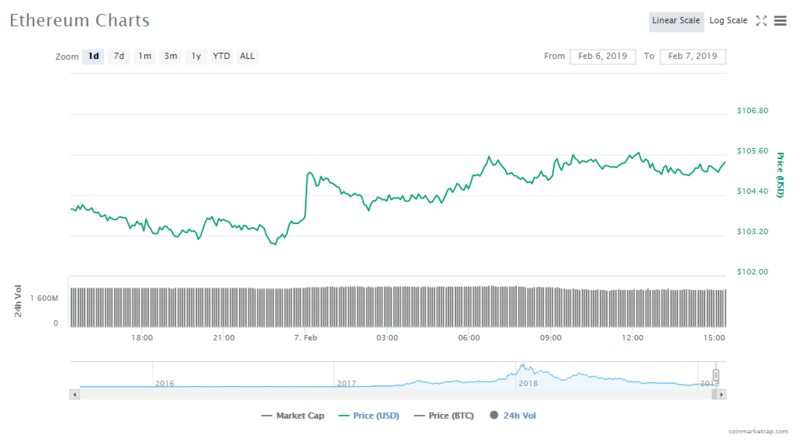 The second highest raise in token price in trading so far today is for Binance Coin, which has retained its position at tenth place with an increase of 1.68%. Ethereum is the third biggest mover in today’s trading, with its token price going up by 1.48%. Bitcoin’s token price is $3415.94, down by 0.16%. Bitcoin’s current market value is $59.86 billion. Ripple’s token price is $0.291253, down by 0.42%. Ripple current market value is $11.99 billion. Ethereum’s token price is $105.39, up by 1.48%. Ethereum’s current market value is $10.88 billion. EOS’s token price is $2.36, up by 1.34%. EOS’ current market value is $2.13 billion. Bitcoin Cash’s token price is $116.70, up by 2.53%. Bitcoin Cash’s current market value is $2.05 billion. Tether’s token price is $0.999096, down by 0.14%. Tether’s current market value is $2.01 billion. Litecoin’s token price is $33.22, up by 0.82%. Litecoin’s current market value is $2 billion. TRON’s token price is $0.025782, down by 1.12%. Tron’s current market value is $1.71 billion. Stellar’s token price is $0.075710, up by 0.23%. Stellar’s current market value is $1.45 billion. Binance Coin’s token price is $8.32, up by 1.68%. Binance Coin’s current market value is $1.17 billion. The South African investment firm that has more than 180 billion Rand (~$14.5 billion) under its management, Sygnia Asset Management announced that it is planning to launch its own cryptocurrency exchange later this year. According to Atom Solutions, there are many options when it comes to foreign workers making overseas remittances. The only catch, however, is that all of them are imperfect. It holds true that costs can be quite high, especially when trying to complete transactions through a traditional bank.